If you want to watch the GAEA Japan events I am reviewing, Mike Lorefice sells the complete seasons at a very reasonable price both via download and physical copy. Mike’s quebrada.net is one of the sites I’m using to write these reviews, its a great resource for learning more about GAEA Japan and wrestling in general. Even though this wasn’t a major event, we still have to watch it because 1. I am not skipping shows and 2. you never know where there may be a hidden gem that no one knew existed. All the wrestlers have profiles on Joshi City, you can click on their names above to go straight to it. 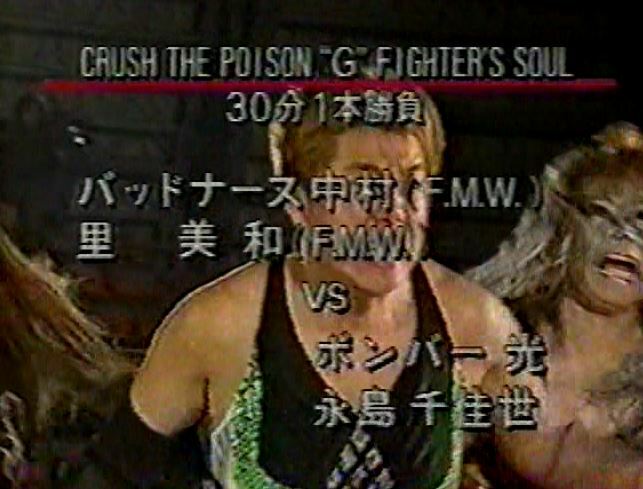 FMW invasion! FMW wrestlers have been a regular sight in GAEA Japan since they launched. GAEA Japan doesn’t have a large enough roster at this point to have a show without outside help, so FMW and JWP chip in when needed. Nakamura and Sato were both in Shark Tsuchiya’s Mad Dog Military, a heel group in FMW that frequently battled with Kaori Nakayama and Megumi Kudo in the promotion. This is Sato’s first time in GAEA Japan while this is Nakamura’s second match there. On the GAEA Japan side is veteran Bomber Hikari teaming with rookie Chikayo Nagashima. Bomber retired in 1997, while Chikayo Nagashima still wrestles today, mostly in Marvelous. The GAEA Japan team attacks before the bell rings but the advantage lasts about two seconds until Team FMW gets Bomber isolated. Bomber hits a crossbody on both of them and Chikayo comes back to help as the double team Team FMW. Bomber and Sato stay in the ring as legal, scoop slam by Bomber and she covers Sato, but Sato bridges out of it. Another slam by Bomber and she hits another one, crab hold by Bomber but Nakamura breaks it up. Bodyblock by Bomber and she tags Chikayo, snapmare by Chikayo and she starts on Sato’s leg. Crab hold by Chikayo but Sato gets out of it, Sato avoids her dropkick and she tags in Nakamura. Scoop slam by Nakamura and she dropkicks Chikayo, another dropkick by Nakamura and she hits a vertical suplex for two. Chikayo is double teamed in the ropes, Nakamura steps on Chikayo’s hands and both she and Sato stomp on Chikayo. Sato stays in as legal and stomps on Chikayo while she is in the Tree of Woe, Sato sits down on Chikayo when she goes for a sunset flip as Team FMW stays in control, Nakamura is tagged back in and she is double teamed in the corner. Sato teases letting Chikayo tag out but twists her arm instead, cradle by Sato but it gets a two count. Sato tags in Nakamura and she hits a back elbow, scoop slam by Nakamura and she tags in Sato. Chikayo snaps off a Stunner and tags in Bomber, Bomber goes off the ropes but Nakamura hits her from the apron. Sato gets a weighted cloth of some sort and beats Bomber with it, she tags in Nakamura and Nakamura cracks Bomber in the head with a soda can. Double Irish whip by Bomber and she gets hit with two cans, but Sato eventually hits Nakamura by accident, Bomber gets the can and hits Nakamura in the head repeatedly with it. Bomber takes Nakamura out of the ring and tosses her into the railing, they return to the ring and Chikayo hits a missile dropkick on Nakamura for a two count. Front roll into a headbutt by Chikayo followed by a headscissors, catapult missile dropkick by Chikayo but Nakamura bridges out of the pin. Chikayo tags Bomber but Sato chokes Bomber from behind, Sato stays in and tosses around Bomber by the neck. Bomber is double teamed in the corner, scoop slam by Sato and she hits a leg drop for two. Nakamura returns, jumping neck drop by Sato on Bomber so she hits a second one, cradle by Nakamura to Bomber but it gets a two count. Rolling cradle by Nakamura to Bomber, but that gets a two count as well. Nakamura puts Bomber in the STF but Chikayo breaks it up, scoop slam by Bomber but Nakamura kicks out. Over The Top by Bomber, she picks up Nakamura and goes for a backdrop suplex but Nakamura reverses it into a roll-up for two. Spin-out powerbomb by Bomber, but Sato breaks up the cover. Bomber picks up Nakamura and slams her in front of the corner, she goes up top but Nakamura avoids the Reverse Splash. Diving knee strike by Nakamura, but Chikayo breaks up the pin attempt. Nakamura tags in Sato, she brings in a chair and DDTs Bomber onto it before putting the chair into the corner and driving Bomber’s head in it. Chikayo comes in and takes the chair, hitting both Nakamura and Sato with it. Chikayo tags in, scoop slam by Chikayo onto Sato but Sato shakes her off and boots Chikayo in the face. Sato goes for a suplex but Chikayo reverses it into a cradle, front roll into a headbutt by Chikayo but Nakamura trips her from the floor. Scoop slams by Sato to Chikayo and she hits a backdrop suplex hold for two. Sato goes up top and hits a missile dropkick, cover by Sato but Bomber breaks it up. Nakamura comes in with a chain and jokes Bomber, Sato suplexes Chikayo but Chikayo gets a shoulder up on the cover. Double arm suplex by Sato, she picks up Chikayo and hits another suplex but pulls up her head again on the cover. Backdrop suplex by Sato but she stops the pin as she taunts Bomber, powerbomb by Sato and she finally keeps her covered for the three count! Bad Nurse Nakamura and Miwa Sato win the match. This match started too slow for me to get excited about but the end stretch was really good. I don’t mind long beatdown segments but in this case the beatdown wasn’t very interesting, as the offense stayed basic. They picked things up dramatically once Team FMW started using weapons and Chikayo was tagged back in for the last few minutes as she showed a lot of fire. I loved the ending with Sato just repeatedly dropping Chikayo while taunting Bomber and then pinning Chikayo anyway, as the normal wrestling thing to do would be to give Chikayo a hope spot while instead she just destroyed her. Slightly more good than bad, it just took a bit too long to get going. This was the semi-final match of the evening, so for the second straight show we are not watching the main event. This is a pure GAEA Japan affair, as they pair a veteran of the promotion with one of their rookies to face off. Since the promotion contained so many rookies in 1995, it was common for them to be featured in bigger matches as it was in the promotion’s best interest to get them elevated as quickly as possible. Sonoko and Toshie start the match, shoulderblock by Sonoko but Toshie comes back with a dropkick. 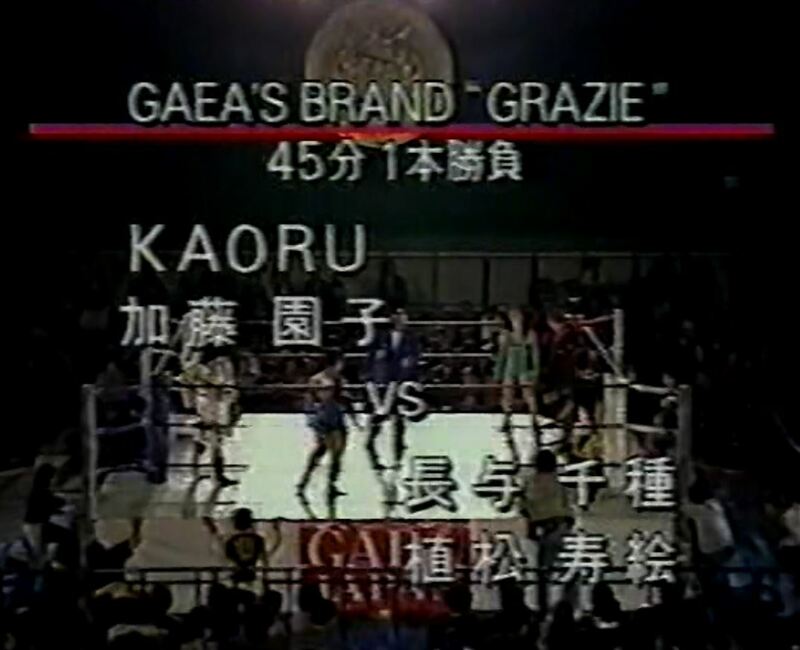 They reach a stalemate and tag out, Nagayo and KAORU play to the crowd until KAORU hits an armdrag. Nagayo comes back with her own armdrag and they also reach a stalemate, Nagayo attacks KAORU from behind and Toshie runs in so they can double team her. Belly to belly suplex by Nagayo but KAORU bridges out of the pin, Toshie is tagged in but KAORU catches her with a powerslam and tags in Sonoko. Sonoko dropkicks Toshie in the corner, Toshie comes back with snapmares and she applies a headlock, but Sonoko rolls out of it. Toshie tags Nagayo, Nagayo locks knuckles with Sonoko and gets her to the mat, Sonoko tries to get Nagayo off of her but Nagayo kicks her hard in the back. Sonoko gets Nagayo’s arm but Nagayo gets into the ropes, dropkicks by Sonoko but Nagayo levels her with a clothesline and tags in Toshie. Dropkicks by Toshie to Sonoko but Sonoko sneaks in a cradle and makes the tag to KAORU. Toshie tries to elbow KAORU over and finally does so, but KAORU quickly gets back up and delivers a dropkick. Crab hold by KAORU but Toshie gets to the ropes for the break, KAORU grapevines Toshie’s leg and applies the Muta Lock, bridging fallaway slam by KAORU but Toshie kicks out at two. KAORU tags in Sonoko, Lou Thesz Presses by Sonoko, scoop slam by Sonoko and she covers Toshie for two. Irish whip by Sonoko and she hits a dropkick, Sonoko tags in KAORU but Toshie dropkicks her as well. Toshie tags Nagayo, spinning heel kick by Nagayo and she hits a second one for a two count. Nagayo Irish whips KAORU but KAORU puts her in a sleeper, Nagayo rolls into the ropes and she manages to force the break. Nagayo manages to tag in Toshie, Toshie puts KAORU in a crab hold but KAORU quickly gets into the ropes. Toshie puts KAORU in a stretch hold but KAORU rolls out of it, she tags Sonoko and Sonoko delivers a dropkick. Another dropkick by Sonoko to Toshie and she covers her for two. Scoop slam by Sonoko but Toshie bridges out of the pin and hits a side headlock takedown. Sonoko picks up Toshie and KAORU comes off the top turnbuckle with a lariat, missile dropkick by KAORU but Toshie falls back into her own corner and tags Nagayo. Nagayo catches KAORU with a sit-down powerbomb but Sonoko breaks up the cover, KAORU hits a trio of German suplexes on Nagayo before hitting a moonsault on Nagayo for a two count cover. Sonoko goes up top and hits a missile dropkick but Toshie runs in and dropkicks her, Nagayo kicks KAORU out of the ring and goes out onto the top turnbuckle, diving out of the ring onto KAORU. Nagayo rolls KAORU back into the ring and slams her to the mat, but Sonoko breaks up the cover. Nagayo picks up KAORU but KAORU rolls away and tags Sonoko, but Nagayo greets Sonoko with a lariat. Nagayo tags Toshie, diving crossbody by Toshie but Sonoko comes back with a bulldog. Another bulldog by Sonoko and she hits a leg drop, picking up a two count. Sonoko tries to throw Toshie in the corner but Toshie reverses it and runs up Sonoko, she goes off the ropes but Sonoko hits a Lou Thesz Press. Seated senton by KAORU, she puts Toshie on her shoulders while Sonoko goes to the top turnbuckle, and Sonoko hits a missile dropkick. Cover by Sonoko but Nagayo breaks up the cover. Nagayo hits a heel kick on Sonoko and hits a sidewalk slam, Toshie cover Sonoko but KAORU breaks up the cover. Nagayo kicks KAORU out of the ring, Toshie picks up Sonoko and applies the Japanese Rolling Clutch, but Sonoko rolls through it. Nagayo returns and gets Sonoko up in a powerbomb position, Toshie goes up top and hits a crossbody while Nagayo delivers the powerbomb, and Toshie picks up the three count pinfall! Chigusa Nagayo and Toshie Uematsu win! Not one of the more important or critical to watch GAEA Japan TV airings. They didn’t even show the main event, which was a ten wrestler tag with all the wrestlers that had already been on the show. Unless you are a completist, nothing to see here that isn’t done better on a different event around this time period.